We had lots of gorgeous material to use for our dresses. Join us as we sew items for our Operation Christmas Child (OCC) boxes. Our current projects are: Cloth pads with bags, pillowcase dresses, small bags and dolls. We meet once a month at Cordova Neighborhood Church, 6:00pm. The dates are as follows: May 19 … June 29 … July 28 … August 25 … September 29 …. October 20. Have questions? Contact Lucy Baptista. Or leave a comment here. Don’t sew? Don’t want to come out on a Friday night to put together these items? There is a way for you to be involved. We are collecting items for OCC boxes. THANKS so much to those of you who donated during April. During May we are collecting assorted items. Drop off at the Church. Marbles, jacks or Legos to fill the small bags we’ve sewed. Brightly coloured cotton material with matching bias tape. 2 yards of material is enough for one pillow case dress and matching doll. Shoe boxes: either empty card board shoe boxes or quality plastic boxes (the size of a shoe box). Of course you can still drop off non-liquid personal care items: comb, hair brushes, toothbrush with holder, soap with holder, flash light with extra batteries, etc. NO TOOTHPASTE. Do you participate in OCC? If you make items for your box(es), what do you make? “Everyone Can Help One Child,” said Twila Paris. 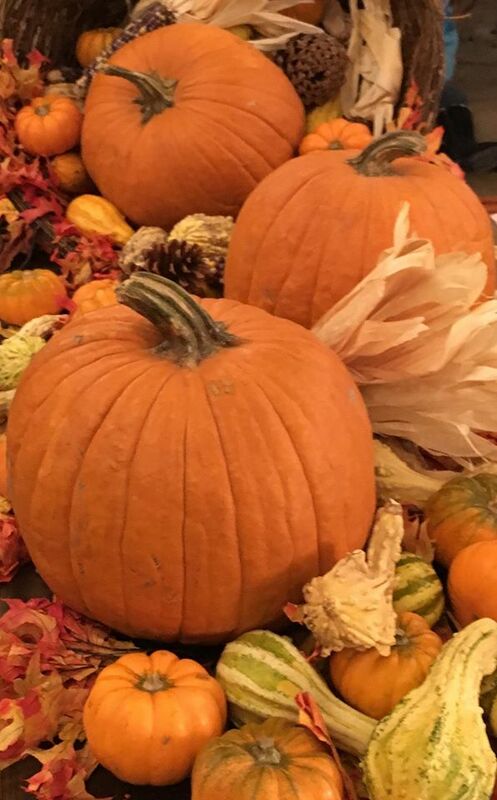 Yosemite’s Ahwahnee Hotel had amazing centerpieces Thanksgiving weekend. ‪#‎GratitudeScavengerHunt‬ – This photo went into the “Something I’m grateful for that tastes good” category. How well do you finish all the things on your bucket lists? I am great at writing them, but have troubles finishing. Well, not this month. This month, I finished all the things I wanted to!!! Below is the original November list and some details about the item. ONE. Read – A Christmas Carol by Charles Dickens before seeing the play. TRUTH DISCLAIMER – I didn’t actually read the book, but I listened to a free audio version. Except for kids books, I have never listened to an audio book. I thought I would do some work while listening to this story, but I ended up sitting in my chair on 3 different occasions just listening. This was quite enjoyable and I will do this again. I also read a book about gratitude: Choosing Gratitude: Learning to Love the Life you Have by James A Autry. Here is my recap post about that book. TWO. Field Trip – Go see A Christmas Carol: The Musical with the PEP group at Folsom Lake College. This was a fun night out with 9 women and 2 men. The acting, staging and music were a delight. THREE. Write Another Bucket List – Write a Singles Thanksgiving Bucket List and do at least a few of the items. Before Thanksgiving or during Thanksgiving weekend, I did numbers One (Watched A Charlie Brown Thanksgiving) Five (Made silverware holders), Six (Made this prayer pumpkin), Seven (Scavenger Gratitude Walk), Eight (I gave our waitress a BIG tip.) and Ten (Made a snowman ornament, but not the block one. I used these directions. 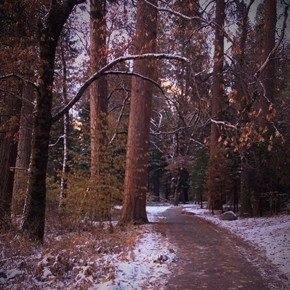 This spot in Yosemite didn’t have much snow Thanksgiving weekend, but it was beautiful and cold! FOUR. Celebrate Thanksgiving in a new way – We won’t be going to the beach this year. I had the joy of Thanksgiving at my sister’s home. It was a merry and tasty time. And then I spent Friday and Saturday in Yosemite with my daughter. FIVE. Make grown up Advent calendar. See this online Advent calendar. Here is an advent chain to make. Advent November 29 (ends December 24). I made an Advent Prayer Wreath. The base is a felt quilled wreath kit I picked up from Michaels last year after Christmas. I cut out 24 extra leaves. Each day I will write a name on one leaf and pray for that person. And then I will glue the leaf onto my wreath. All the numbers start off upside down. As each day comes and I finish the daily “project”, the number will be righted. 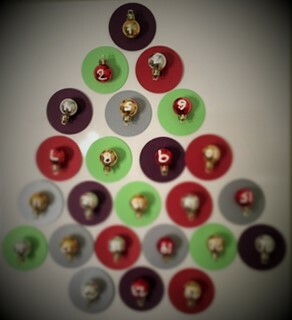 I also made a magnetic tree ornament advent calendar. I got the directions from here. I decided to read several advent books. With my church I am reading Walking the Road to Bethlehem. The Sunday sermons will go along with these readings. I am also reading The Season of the Nativity: Confessions and Practices of an Advent, Christmas & Epiphany extremist by Sybil Macbeth. I will see if I add anything to my celebrations. SIX. Donate something extra. Operation Christmas Child is something I always do. And I did it again this year. To add to the joy of doing this project, my daughter-in-law also did this with me. Together we filled 20 boxes. SEVEN. Try a new pumpkin recipe. A friend (Michelle) and I made a paleo pumpkin and tomato soup. I made a 2nd batch and put some into the freezer. Your Turn . . . Have you done anything mew this past month? Or something that helped you celebrate Fall? I found this idea on Pinterest. Unfortunately the link did not go back to the original designer. This is my version of the original. For our family’s 2nd annual ornament-making fest, I scoured the internet for many months before coming across the cutie I will be showing you. We make other ornaments besides snowmen, but the star of the program is always a snowman. This is the link I have for our star snowman. Clean eyeglasses with cleaner. Rinse well with water. Dry with non-lint towel. Paint lenses of eyeglasses in a thin coat of white paint in one direction. Try to keep paint off the rim of the glasses. Let it dry thoroughly. You can use a hair dryer to help it dry more quickly. If you put on more paint when it is still wet, some paint will come off. That is why you need to let it dry between coats. Paint lenses in the opposite direction with a thin coat of white paint. Let it dry thoroughly. You can use a hair dryer to help it dry more quickly. Do this 2 or 3 more times, or until you have a totally white surface. If you paint in thin layers and alternate directions, each time you will end up with a smooth surface. 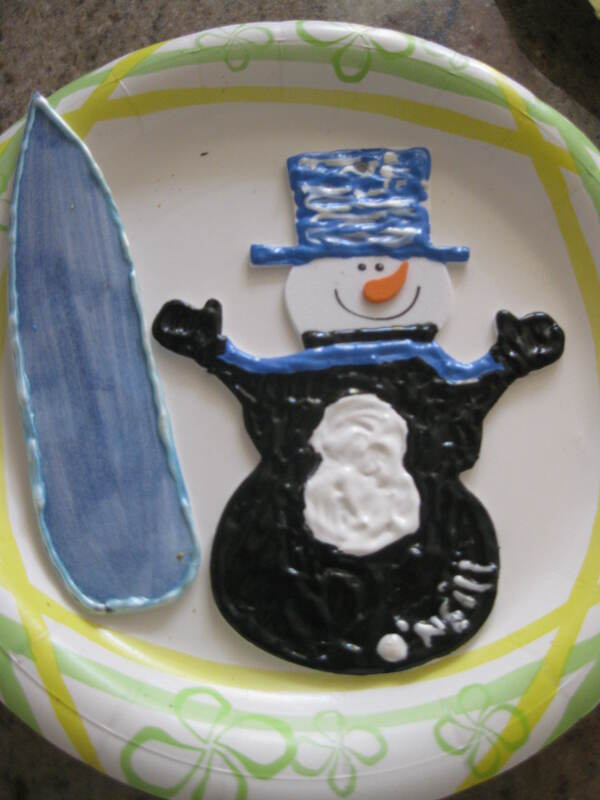 However, it will still look good, if the surface isn’t smooth; after all, real snowmen aren’t smooth. Eyes: Practice making ovals on a scrap piece of paper. In the top lens about a finger width down paint two ovals in black. Paint two lines for eyebrows above the eyes in black paint. Nose: In the middle of the lenses, make an orange triangle. Start with the fat end of the carrot ending with the pointy end. Mouth: Dip the end of your paint brush into black paint. Use this end to make dots for the mouth. Let the top lens dry while you work on the bottom lens. Buttons: Using black paint make three circles on the bottom lens. Or you can use the end of a fat paint brush or pen dipped in black paint to make the circle buttons. Eyes: Dip your paint brush end into white paint. Use this end to put dots onto your eyes to give them dimension. Nose: Using a liner brush dipped in black paint, outline the carrot in black. Also paint a few vertical lines. Bottom Lens – Buttons: Paint a small white curved line on the buttons. When both lenses are dry do the following: Put blush on a small, dry paint brush. Make circles on the cheeks. 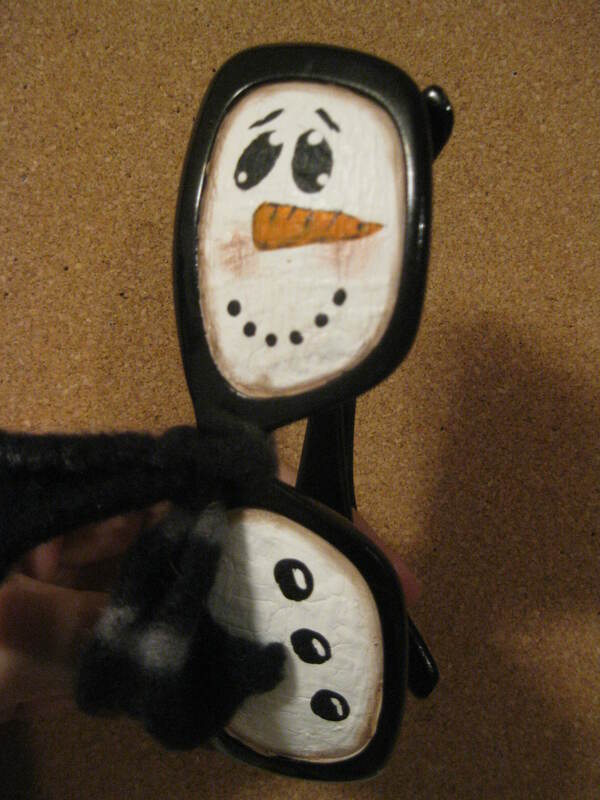 Outline the snowman with same blush or desired colour of eye makeup. On the inside of the lenses, paint your initials and current year. Wipe off frames well. Clean off smudges and any white paint. In a well-ventilated area, spray the acrylic spray the outside and inside of lenses. Use thin layers. Tie the strip of the fabric on the “neck” of the snowman. Put the snowman onto your tree and admire. Take a picture and send it to me so I can make a post with everyone’s creation. Or write your own post and link it to this one. During November I am writing or posting a photo about something for which I am grateful. This explains why. My gratitude posting for November 28: I am finally making time for crafting. Besides being fun, crafting gives me something pleasant to think about, gives me more creative thoughts in all areas, and is a stress release. And when I craft with others, it is a bonding experience. Did you make this snowman? 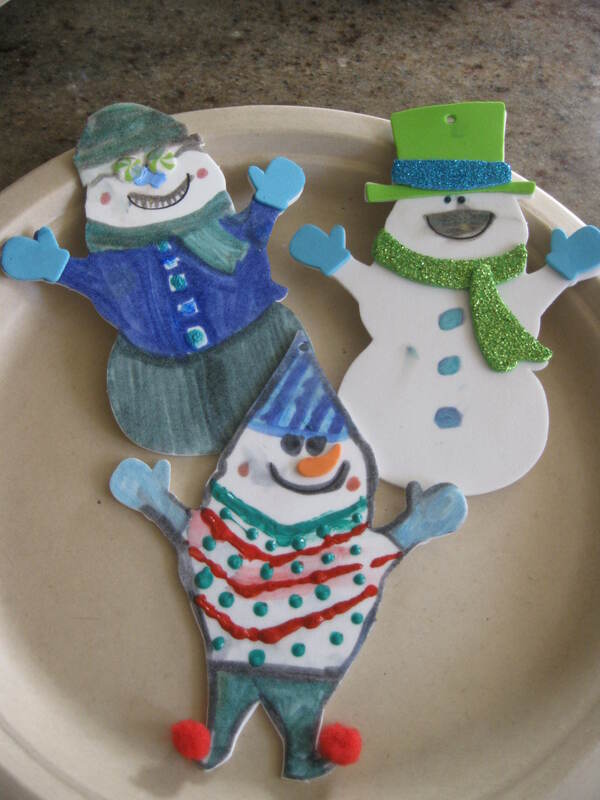 Did you make any ornaments, snowman or otherwise, this year? Do you give ornaments as presents? The designers for the snowman foam kit, couldn’t have envisioned their product looking this cute. It was the beginning of the greatest Christmas ever. Little food. No presents. But there was a snowman in their basement,” (Markus Zusak, The Book Thief). Snowmen can even be part of family traditions. Top left ornament is from a wooden kit. For many years, I have bought my nieces and daughter a snowman ornament. And now on the day after Thanksgiving we congregate to make ornaments. This year I bought 2 kits. 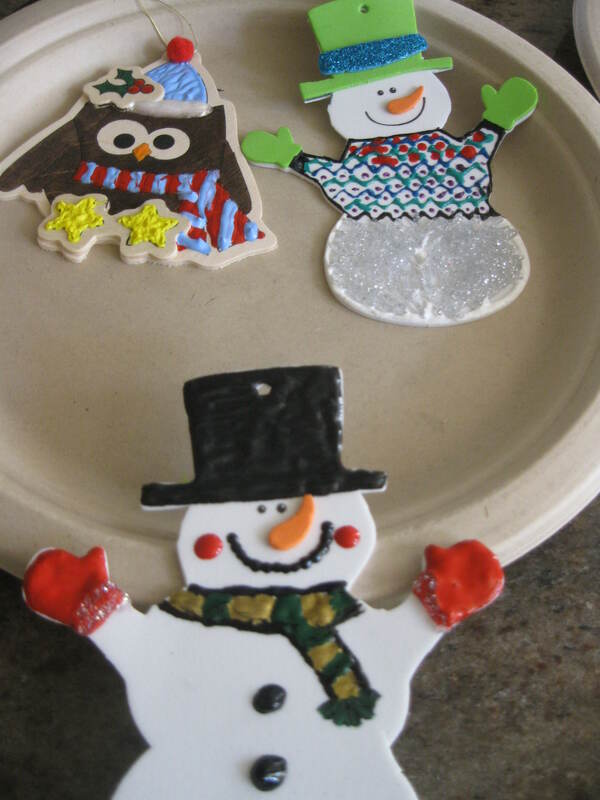 One was a foam snowman kit and the other kit had wooden ornaments: owl, penguin, sock monkey and snowman. 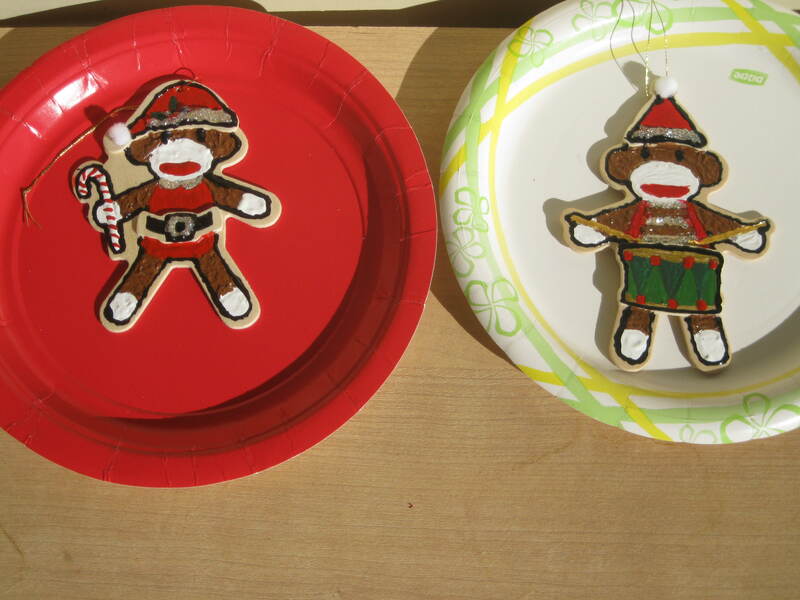 This year we decorated with puffy paint (of course), markers, and craft paint. I even had glow-in-the-dark paint in green and orange. Aren’t these sock monkies darling? Of course we put our names and the current year on the backs. You think you are always going to remember the year when you did something memorable. But you don’t. I think it would be neat to glue a current photo onto the back of one of the yearly made ornaments. I hope to remember to do this next year. i also hope I remember to print the photo onto archival paper so that the photo will last throughout the years and become a true heirloom. There was one ornament that was the star. The foam and the wooden ornaments were the warm up acts. I looked all year long for THE ornament we would make. The fuzzy bit in the middle is a scarf. not go back to the original designer of this project. It was easy enough to duplicate for all ages from 11 to 54. If/when I write a tutorial for this ornament I will include the link here. Go here for the eye glass tutorial. My gratitude posting for November 27: Making memories and then recalling them from year-to-year help connect me with family and friends. They remind me what’s good and precious in life. 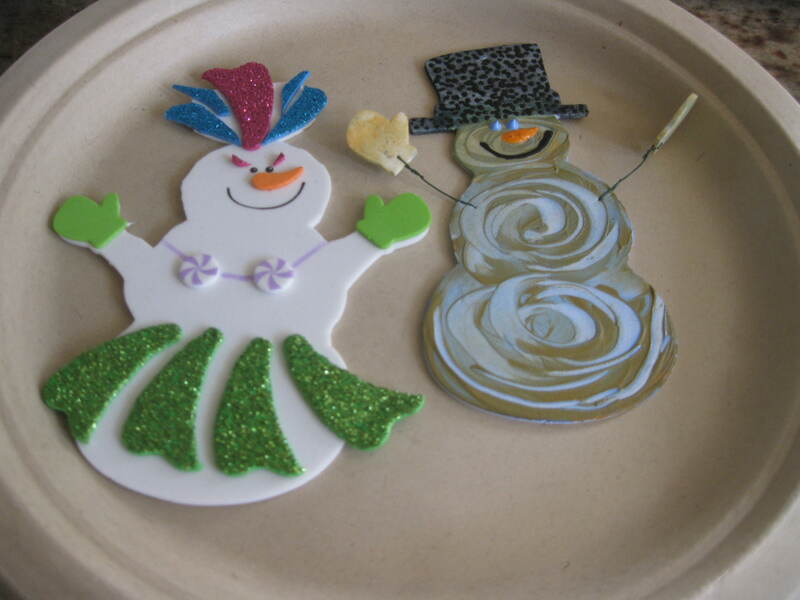 Are you enamored with snowmen or any other decorator object? Do you buy yearly ornaments for anyone? If yes, who? What kinds of traditions do you have at Christmas time? What do you do when your energy is low? 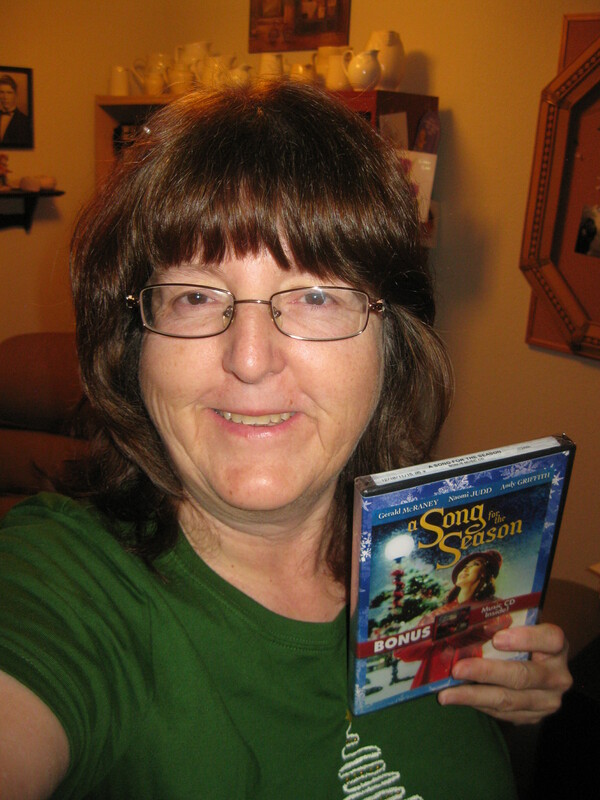 Here I am wearing a $0.75 clearance Christmas tee-shirt holding the newest addition to my collection of Christmas movies.. .. .. May be silly, but watching this is going to energize me. The first thing I do is to figure out why my energy is low. Knowing the answer to this will help me decide what I can do to energize myself. I “study” myself and see if my energylessness is one of the below ideas. Have a read-through and see which one(s) could account for your low energy. . .
Situational. Has something happened that has zapped your energy? My prayer partner says when I am feeling low to look back 72 hours. Lots of times something happened then that is now reflecting in my low energy now.. .. .. The following are some examples: Did poorly on something.. .. .. Had a fight with someone close.. .. .. Received shocking news.. .. .. Encountered a majour disappointment.. .. .. Body Need. Have you heard of H.A.L.T.? These are “ailments” that can influence moods. The letters stand for the following: Hungry, Angry, Lonely, Tired. Whenever we are under the influence of any of these, it is normal to feel low energy. For women the “H” can also stand for hormonal. Spiritual. People are spiritual beings. So when the spiritual part of yourself is out-of-sorts, your general energy level is out-of-sorts. Are you communicating (I.e. through prayer & Bible reading) on a regular basis with God? Is a particular sin trapping you? Too Busy. Being busy, especially too busy, seems to be a by-product of living in America today. We are encouraged (by media, inappropriate role models, and our own insecurities) to achieve all we can, all the time, in all areas of our life, without excuse. Whew! That made me tired to just write and read that. No Clue. Sometimes we just don’t have a clue as to why we are feeling the way we are. Just because we are clueless doesn’t mean we can’t do something to up our energy. Now that you have an idea (hopefully) as to the cause of your low energy, read on for some tips to fuel up. Many of the below suggestions can apply to more than one cause. Pick one that sounds do-able, comforting, or just intrigues you. If that one doesn’t work, try something else. Nap. This is my favourite and most used comfort tool. If/when that doesn’t work, I go on to the other suggestions. For a bit of silliness read 5 Things I Learned Between Naps. Plan something. The most fun and energizing part of any activity is the planning – for me. “Passion is energy. Feel the power that comes from focusing on what excites you”(Oprah Winfrey). Destress. Sometimes I unconsciously let life get to me. Knowing how to destress can give me back much needed energy. Read 21 Ways to DeStress Your Life for ideas on how you can destress. Meet a need. Look at your body and see what need you are ignoring. Good food? Alone time? Glass of cold water? Exercise? Cancel an out-of-the-house activity? Treat yourself well by indulging your need. Combat worry. Worrying always drains my energy and NEVER helps with the situation. Some ways I combat worry are by.. .. .. Prayer.. .. .. Journaling.. .. .. Talking with a wise person.. .. .. Balance my checkbook or some other left-brain activity.. .. .. Refusing to think about it.. .. .. Read 8 Ways to Stop Worrying by Lisa Burgess at Lisa Notes. Copy verses. God’s WORD is truth. Sometimes I need truth purposefully zipping through my brain. I underline meaningful verses in my Bible. When blue, I grab paper and pen and copy down those verses – especially verses from the Minor Prophets. Confess. Stop running and hiding from sin. Confess it. Get into a community of folks who will help you live a holy life. Get with folks who practice forgiveness for themselves and others. 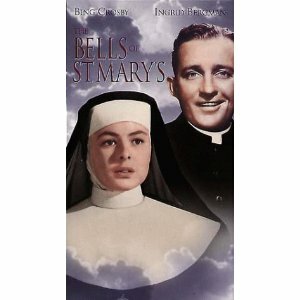 Read Why Confession is Still Good for You by Paul Ellis at Escape to Reality. Play spider solitaire. Playing this allows my hands to be busy, but my brain has the freedom to think whatever it needs to think. When I am trying to plan a paper or solve a problem, I play several rounds of solitaire and I almost always feel energized afterwards. And I usually have a plan of action too. Do something Christmassy. Christmas and all activities related to it, make me smile. If I do one of the following when feeling low energy, I feel better! Watch a Christmas movie.. .. .. Decorate cards.. .. .. Plan a snowman ornament to create with nieces.. .. .. Write yearly letter.. .. .. Sing along with Holiday music. Read 3 Reasons to Watch Christmas Movies. NOTE: This is the 5th photo in the series, A Fall of Self Portraits, from my Fall Bucket List. What are Christmas movies you must see each year? Why do you watch them? I have many reasons to watch Christmas movies. Here are three of them. 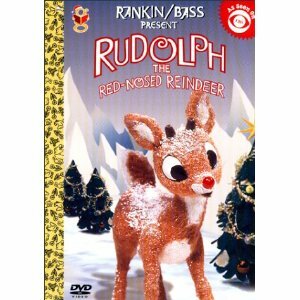 I watch some because they bring back lovely childhood memories: A Charlie Brown Christmas, White Christmas, and of course Rudolph the Red-Nosed Reindeer). I watch some because they remind me of times with my children: How the Grinch Stole Christmas, Prancer, and Miracle on 34th Street. I also watch them because they bring a message of hope while providing clean entertainment. Some make me laugh (The Santa Clause) and some make me think (A Christmas Memory). Below are the Christmas movies I currently own. Most of them are on VHS. What would you add to my list of “must own” movies? 12 Days of Christmas Eve. Go here to read my review. 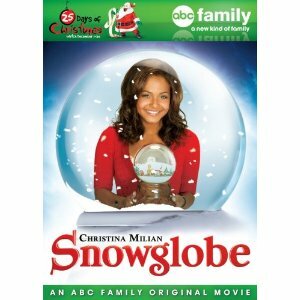 Go here to see Christmas movies I watched in 2011 (but don’t own). What Christmas movies have you seen this year? Were there any new ones? Any surprisingly good? I watch Christmas movies year round. The list below contains movies I’ve seen in 2011 that I do not own. Except for Charlie Brown, I saw these for the first time. I would see any of these again. I have about 10 more movies on my list. If I watch anymore of them, I will update this post. NOTE: For that list of movies I own, go here. I have watched most of these this year as well. 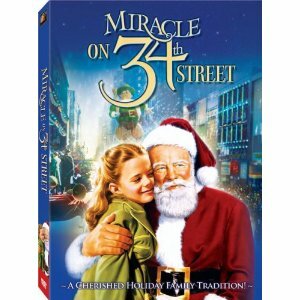 So the total number of Christmas movies I’ve seen in 2011 is really closer to 30.